We know that every child learn things at different speed. Some children may be ready for toilet training at two, while others are still diapering at the age of four! So, whether it is readiness to speak, brushing teeth, self-feeding or listening to instruction, each child has their own timing as to when they are ready to pick up a new skill. However, understandably parents like us, would like our children to start picking up new skills as soon as possible. Being able to read for example is increasingly important due to our demanding education culture. 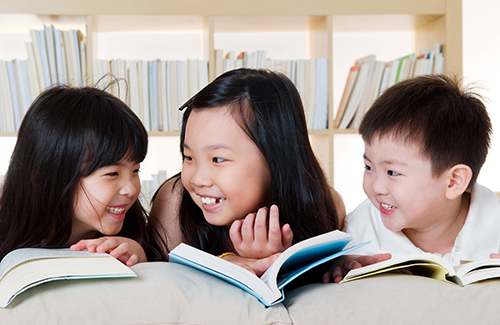 Children who are able to read, pickup facts much faster and gives us the impression that they are ‘smarter’! On the other hand, we do not want to push our children too much until they lose their childhood life, become burnout or fear of school when they enter primary 1. So, where do we find the balance? Expose your child to level appropriate reading materials. It should be level-appropriate instead of age-appropriate because some children may have started reading a 50 words book at the age of 3, while others only at the age of 4. So, always start with a story with minimum words and slowly progress depending on how fast your child is picking up. During our generation, little emphasis was given in picking up reading through phonics. That’s probably why we started reading later than children nowadays. As you may already know, phonics is collection of sound represented by each letter which will help early readers in picking up words by firstly learning sound of each letter. Children nowadays are mostly taught phonics to help them to read sooner, which I could not agree more. While some preschools cover phonics, you may enhance their memory for engaging external phonics tutor or consider the “Children Learning Reading” program. Through this program, children learn to read through phonics. I was pleasantly surprised by a 2 years and 9 months boy reading sentences after following the program and a 3 year old girl could read story book fluently. Quiet amazing! Ensure a good amount of frequency, say once a week, in giving new reading materials. Feel free to bring your child as often as possible to the public library. A good 30 minutes stay can be fruitful. Then, come home with half a dozen of books – fiction or non-fiction. Girls are likely to read Angelina Ballerina and boys are likely to read fire trucks books or stay save by picking Super Why series as they are everyone’s favourite. So carefully pick their topic of interest. Select books with good graphics to promote interest. Read to your child as often as possible while running your fingers along the words. This will allow your child to pickup reading twice as fast! Allow learning through repetition by reading the same books 2-4 times over the next few days. I think each child could pickup reading with some help. In short, your child’s reading interest begins with you. Happy reading! See a boy as young as 2 years and 9 months reading in the Children Learning Reading program.